Mahidolia paucipora is a new species of shrimpgoby from Milne Bay Province, Eastern Papua New Guinea. Collected from a depth of 14 to 27 m in a sandy-rubble bottom. Shrimp associated goby lives in burrows with its partner. The body is white with five brown bands and has a black patch towards the end of the dorsal fin. That is the reason Mahidolia’s are commonly known as the flagfin gobies. 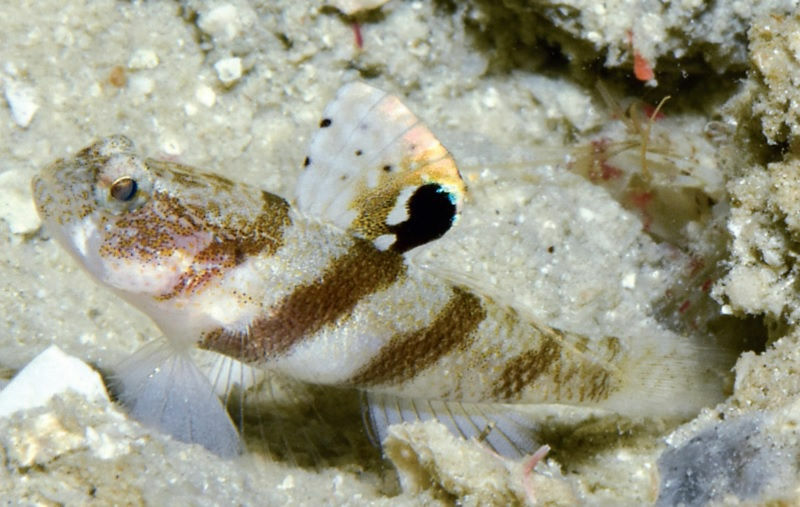 The size of the new shrimpgoby, Mahidolia paucipora is less than an inch. The new species is currently known only from two locations in Milne Bay Province, Papua New Guinea. Which is separated by a distance of approximately 43 km. The locations are isolated small reef patches with silty-sand and rubble bottom. Closely being compared to Mahidolia mystacina, but differs in colors and size. With new technology in scuba diving and better cameras is making it possible to get this such a small species to surface. Which would go unnoticed otherwise. So, if you want to know more in detail about M. paucipora the complete set of papers are with Journal of the Ocean Science Foundation.